DOVER – With the 2018 summer season and ideal weather ahead, many boaters soon will be heading out on the water. DNREC’s Fish & Wildlife Natural Resources Police Office of Boating Safety & Education encourages boaters to practice safe boating, not just during National Safe Boating Week – but also throughout the year. Who is in the Photo? This morning, DNREC Secretary Shawn M. Garvin and Fish & Wildlife Natural Resources Police officers joined members of the General Assembly, and U.S. Coast Guard and USCG Auxiliary members to officially kick off National Safe Boating Week at the Fish & Wildlife Natural Resources Police Boat Dock in Lewes. Delaware, which consistently has one of the lowest boating accident rates in the country, had 33 reported boating accidents and three fatalities last year. Statistics support the vital role of wearing lifejackets in keeping boaters safe. In 2016, 80 percent of all boating-related fatalities nationwide were drowning victims, and of those, 83 percent were not wearing lifejackets, according to the U.S. Coast Guard. There have been no fatalities and no reported accidents this year. Coast Guard statistics show alcohol use is the leading contributing factor in fatal boating accidents. In Delaware, the same blood alcohol limit used to measure intoxication in automobile drivers applies to boat operators: 0.08 or above is legally intoxicated. Boat operators found to be at or over the limit face fines and potential jail time, as well as putting themselves and their passengers at risk. “The best way to minimize the risk of an accident is to make the wise choice – don’t drink and boat,” said Sgt. Brooke Africa, Fish & Wildlife Natural Resources Police Boating Safety & Education Coordinator, noting boaters should plan to have a non-drinking designated boat operator aboard if alcohol is being consumed. Delaware law requires children age 12 and younger wear a lifejacket while underway in any vessel on Delaware waters. Lifejackets also are required for water skiers, tubers, and personal watercraft operators and passengers of all ages. Though not required by law, Sgt. Africa strongly recommends all other adult boat operators and passengers, especially those with limited swimming skills, wear lifejackets. Taking a boating safety course can also improve your skills and reduce the chances of an accident. Coast Guard statistics show that in states where boating safety education data is available, 77 percent of reported fatalities occurred on boats where the operator had not received boating safety instruction. Under Delaware law, all persons born on or after Jan. 1, 1978, are required to successfully complete a boating safety course in order to operate a boat in Delaware waters, including personal watercraft, and must carry their boating safety certificate while boating as proof of course completion. For more information, including Delaware’s boating safety course schedule and the online Delaware Boating Handbook, visit the Delaware Boating Safety web page, or contact Boating Safety & Education Coordinator Sgt. Brooke Africa at 302-739-9913. Contact: Sgt. Brooke Africa, Fish & Wildlife Natural Resources Police Boating Safety & Education Coordinator, 302-739-9913 or 302-382-7167, or Joanna Wilson, DNREC Public Affairs, 302-739-9902. 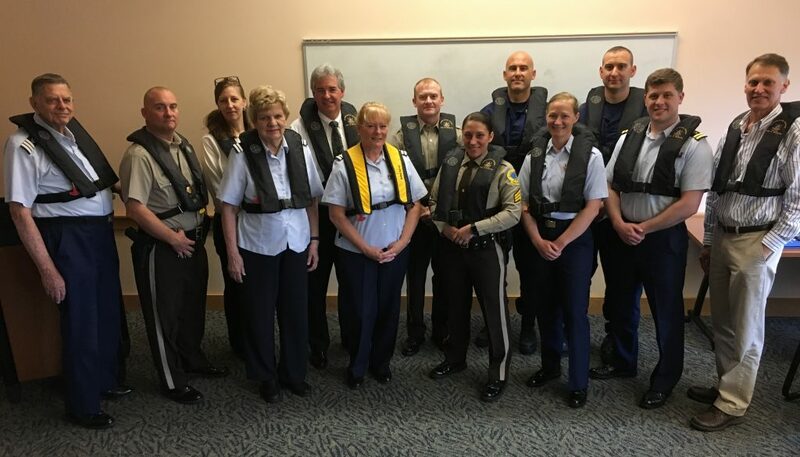 Wearing their lifejackets to work to kick off National Safe Boating Week are, left to right: Harry Otto, USCG Auxiliary, Lewes; Sussex County Capt. Doug Messeck, F&W NRP; DNREC Office of the Secretary Chief of Staff Kristin Barnekov-Short; Nancy Otto, USCG Auxiliary Lewes; DNREC Secretary Shawn M. Garvin; Cindy Chaimowitz, USCG Auxiliary, Lewes; Fish & Wildlife Natural Resources Police Chief Drew Aydelotte; F&W NRP Boating Safety & Education Coordinator Sgt. Brooke Africa; BM1 Collin Snovell, USCG Indian River Station; Chief Micheal Paterson, USCG Lewes Station; BM2 Doug Strong, USCG Indian River Station; Lt. Thomas McGuire, USCG Lewes Station; and State Representative Ron Gray.